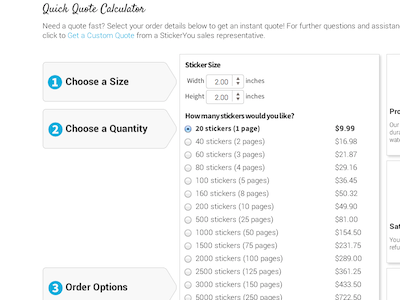 Visit the Quick Quote Calculator to quickly check how many stickers will fit per sheet, or how many "individually cut out" stickers will fit per sheet for pricing purposes. Quick tip: Choose your size from the sticker maker, click “Done Editing”. The first option under “How many stickers would you like?” is the amount of stickers per page. The number of stickers that will print per page depends on the size of the sticker. Our standard page size is 8.5” x 10.5”. So squeeze as many as you can into that area, and there you’ll have it!